Benny C. Bakane died on March 25, 2007 at the age of 81. A lifelong resident of Birmingham and a United States Army veteran, Mr. Bakane served in World War II and earned the ATO, APTO, Good conduct and World War II victory medals. He was an active member of St. Patrick for many years. Mr. Bakane joined the Knights of Columbus in 1991 and served the St. Patrick Council as Pro-Life Director for many years. He was one of the Birmingham Diocese's most recognized leaders in Pro-Life causes. 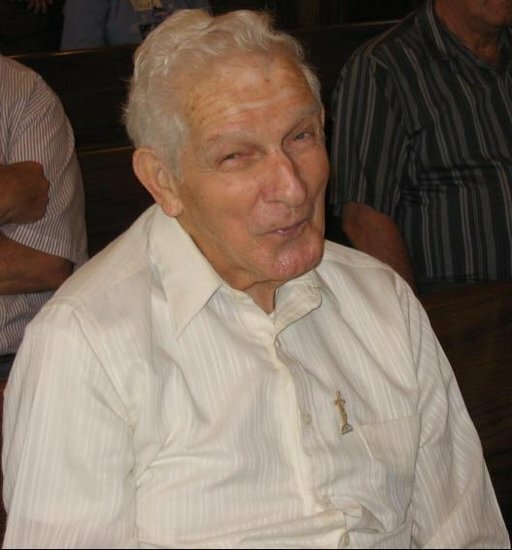 Benny left us with the three words he loved the best: "Jesus Loves You". Editor's Note: We welcome any contributions to this page from any friends or family of our brother Knight Benny Bakane. If you were one of the many who celebrated the life of Mr. Bakane and you have any comments or stories about Benny that you would like to share, please e-mail Louis J. Muro. We also welcome any photos of Benny that you might have. To send an e-mail to Mr. Muro to submit comments, click here to go directly to his contact page.